Yoder Smokers Community Forum • View topic - Metal Thickness 3/16" or 1/4"??? Metal Thickness 3/16" or 1/4"??? I have heard several people say that the metal thickness of all Yoder stick burners is 1/4". But...I was looking at the FAQ page on the Yoder website recently and they say "All Yoder Smokers wood pits are produced from new 3⁄16" or 1⁄4" steel pipe & plate." So which is it? Can anyone confirm this? Thanks! Re: Metal Thickness 3/16" or 1/4"??? So the Kingman is 1/4"? All others are 1/4". Feel free to call 877.409.6337, extension 1 for any questions or to order. 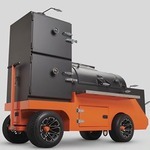 On all things bbq website it says that the Yoder Cheyenne is Constructed from NEW 1/4" pipe and plate. Is that correct? When did Yoder make this production change? I have recently acquired a Yoder Cheyenne (second-hand) that was constructed in 2011. Was it 3/16" back then or is that a more recent change?